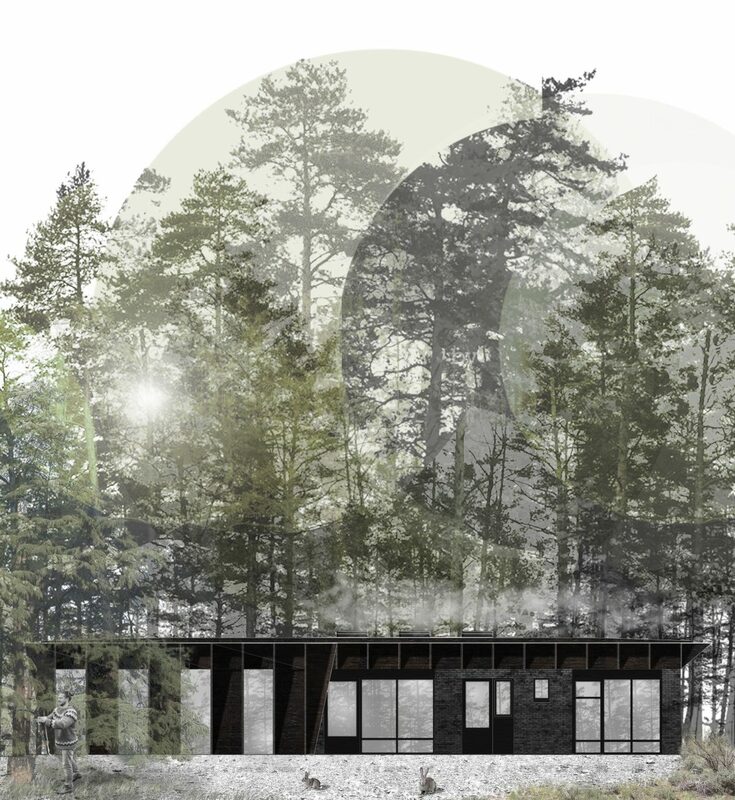 Boshuis (the house in the forest) is a renovation and extension project for a holiday house in the Holten area. The current 53 m² house was built in the 70s and presents today a series of issues related to the poor performances of the envelope. To improve indoor quality, provide the house with a new roof and increase the living surface, FABRICations developed a design based on a smart construction system and affordable materials threated in sustainable way. 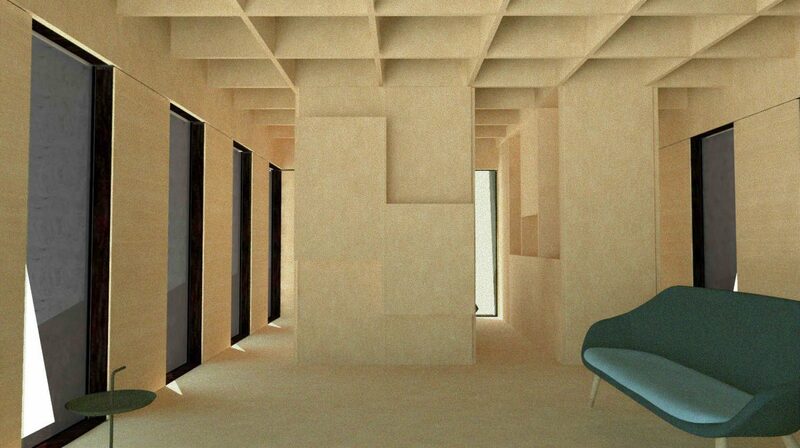 The new extension is fully built out of plywood panels, milled in the production facility and joined in situ. The structure is designed to form a flexible grid, capable of working jointly and supporting the roof in a cohesive effort. 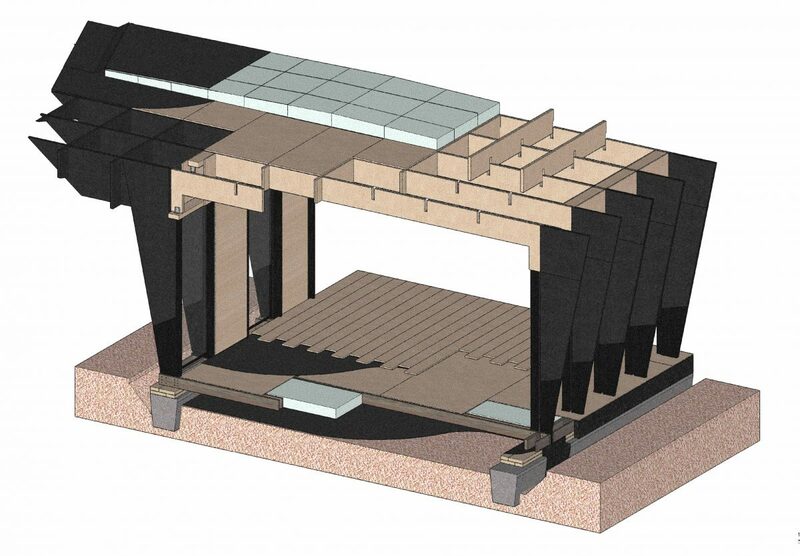 The combination of the plates not only allows for a relatively light but effective roof structure, but it can also easily be supported by the existing brickwork. The spatial outcome of the wooden grid generates a strong aesthetic identity based on a coffered roof. In addition, the grid is extended to the ground to become vertical support and façade of the newly built part of the house. Triangular panels connect the roof to the foundation plateau, matching the verticality of the trees, and an alternation of openable wooden doors and glass plates defines a varied rhythm of the façade. When opened, the doors expand the living space into the surroundings, blurring the boundaries between nature and the house. The outer wooden surface is treated with the Japanese technique of Yaki Sugi or Shou Sugi Ban. Instead of chemical products to prevent wood rotting and parasites, the material is charcoal with a flame and then covered with wax. This treatment makes it water resistant and durable, without compromising its structural properties. In addition, the process conveys to the façade a new materiality based on the darkness of the charcoal. 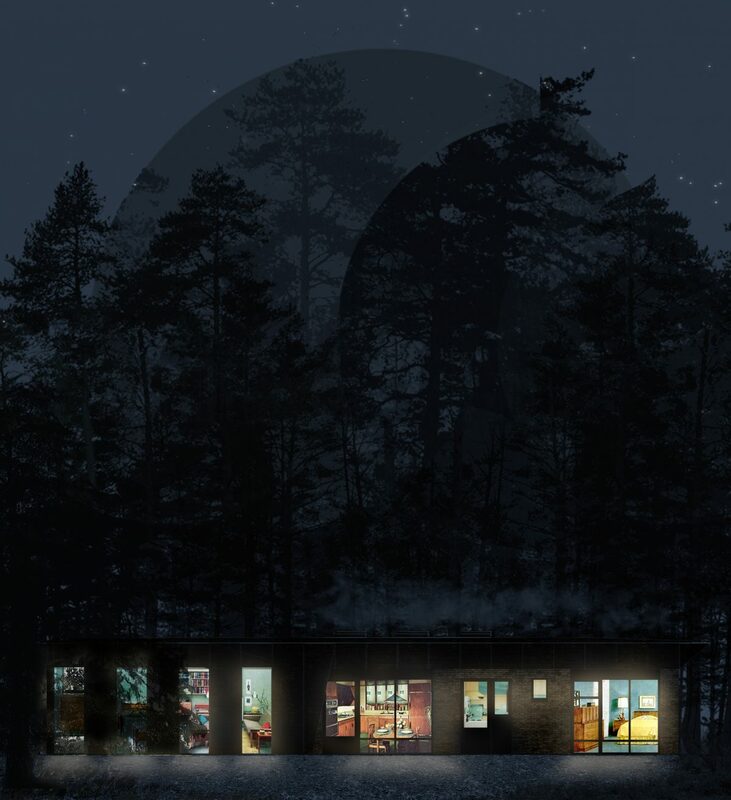 The same dark look is matched by the new layer of paint on the existing house, which chromatically binds together new and old construction to make them a coherent organism. The existing roof is currently damaged (1) and it has therefore to be removed (2). 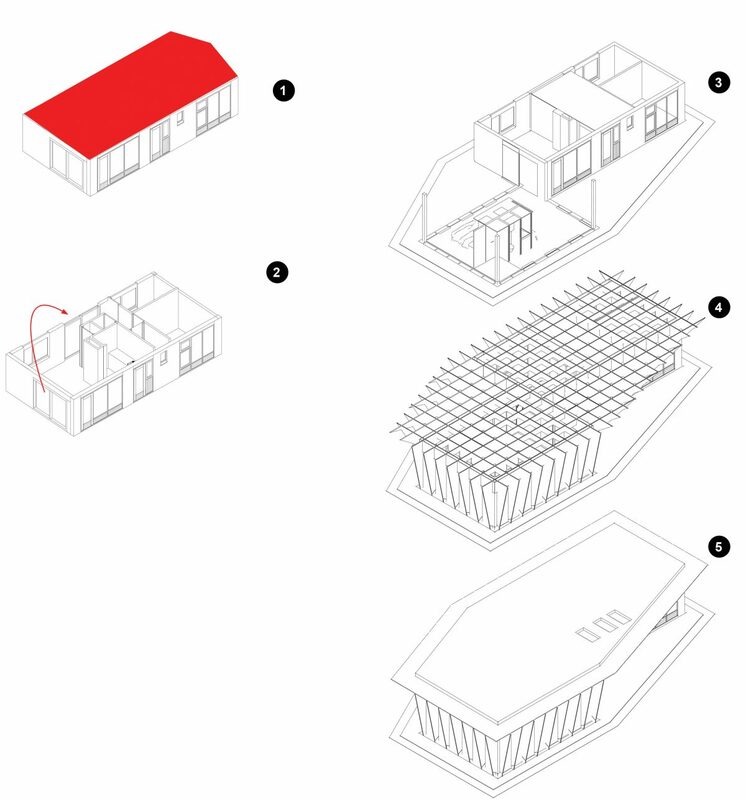 The house extension is built starting from the foundation plateau and the core structure (3), the structural gird of the roof and the vertical supports and later built (4) and finally the roof is completed (5). The constructive system is based on multiplex plates, milled and glued together to generate the structural grid of the roof. The horizontal surface of the roof is also built out of the same boards, while the slope for water drainage is created with insulation panels. The roof is finally covered in bitumen for impermeabilization. The structural grid reduces its depth in the interior, where solicitation from wind is minimum. 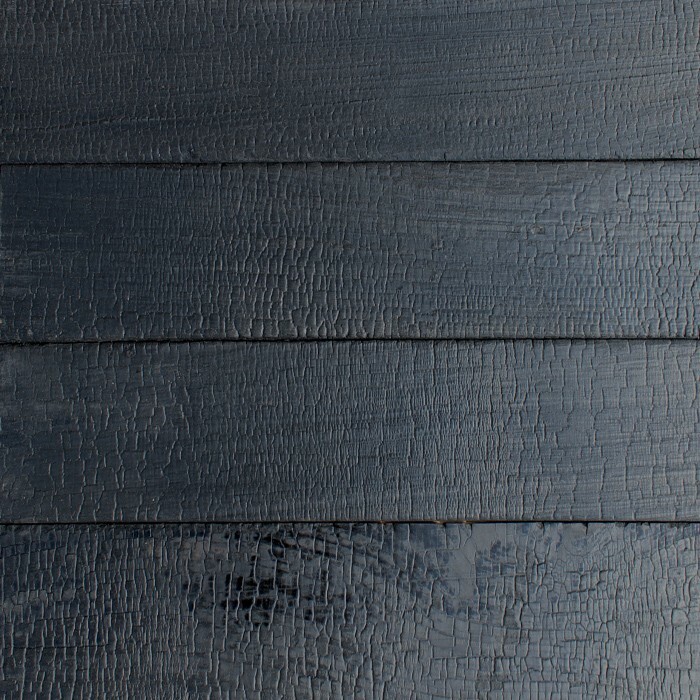 Sample of wood treated with the Japanese technique of Yaki Sugi or Shou Sugi Ban. Instead of chemical products to prevent wood rotting and parasites, the material is charcoal with a flame and then covered with wax. This treatment makes it water resistant and durable, without compromising its structural properties. Interior view in the house extension.